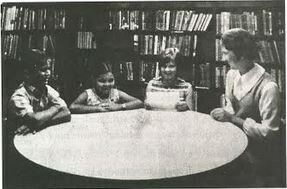 “At the time of the resignation of (the previous librarian) Miss Schall, around 1940, the library finances were very low, but with many donations from individuals, as well as organizations, Mrs. Bessie Jones, for years a board member, with the assistance of several high school girls, managed to keep the library open two afternoons a week. In that spring the board asked me if I would take the office of Librarian and on July 7, 1945, I took over that position. “It was nice to meet with you in your busy library. . . This letter is to confirm the recommendations I offered on the several topics we discussed. . .
“1. The use of catalog card kits from Bro-Dart, Library Journal, Wilson or Catalog Card Corporation of America. This will provide professional accuracy of classification at minimal cost. The purchase of an electric eraser for a) correcting catalog card errors, b) correcting spine lettering, c) cleaning up margins, leaves, boards of books. Registering patrons and providing an expiration date for cards. (Purchase of an) adding machine with credit balance. The time saving factor here is evident and the cost is reasonable today. “We discussed the McNaughton Plan. In the inspection of the acquired books, it appears that little interest is generated. This contrasts with your purchases. I would recommend either a different category of selection in the McNaughton Plan or a trial run of three months without the Plan. Perhaps you will find if you cancel for three months that there is more interest in these books than you had realized. On the other hand, perhaps you will find that you know your patrons well enough now to be able to select materials they are truly interested in. “There is much written on book selection policies in the national library magazines and much talk about such policies in workshops over the nation. These policies are not the end, not holy nor necessarily always right. You know your community and your policies should fit the needs of your community. “Unfortunately, too many of our publishing librarians are solely theorists, having little practical experience. They seem to forget that children are a part of the human race and they want to read what they are interested in, not what the librarians think they should read. If the librarians tried this approach on adults, they would be quickly reminded about freedom to read, censorship, etc. “The Hardy Boys and Nancy Drew series are the focal points of many published articles. They are not considered good literature. What most librarians fail to see is that children enjoy them. Children read them. The librarian’s job is not to censor any patron’s reading regardless of age. “Most librarians fail to ask why do children read them? If they would investigate, they would find that children as well as adults find security in repetition, familiar characters, and familiar locations. Hence, the popularity of numerous trilogies, soap operas, and TV series. I have more faith in children than many librarians. I believe they are capable of becoming more discerning as they mature. When they are ready for more challenging materials they will make the transition because of boredom or need; meanwhile they are still reading. At their December 1971 meeting, the library board voted to continue to use the McNaughton Plan for one more year, and to purchase an adding machine. There is no mention of a discussion about purchasing an electric eraser! In spite of Marlene Thayer’s suggestion that the McNaughton Plan might not be needed, the Marcellus Township Library used the McNaughton service for over 20 years; books were also purchased. Ms. Thayer’s belief that librarians who know their community (rather than experts who know what people “should” read) are best suited to select new books, has been the norm since that time. The Library Director now purchases all new books, with the input of library staff and in response to suggestions from the library board and patrons. The library archives contain very few photographs of the librarians, directors, staff persons and board members who have brought life and development to the Marcellus Library. It would be a great asset to the library if community members who have photographs of previous librarians or board members could bring them to the library to be photocopied for the archives.